Next to the weather, there is nothing Duluthians like to complain about more than the quality and care of their roads and streets. It is probable this pastime exists in all cities, but with Duluth’s extreme winters and its springtime washouts and buckling pavements, it’s likely we have had more to complain about—historically speaking—than those wimpy people to the south. What is hard for us of the present-day to imagine is the swiftness of the boom in street and road building that occurred in the thirty-five years between 1890 and 1925, which coincided with the appearance of automobiles. While we worry about plowing and pothole repairs, in the 1910s and 1920s, it was all about the conversion of gravel to hard surface, and the building of necessary roadways right out of the muskeg. The sheer magnitude of this project dominated the concerns of every farmer, teamster, and wealthy automobile hobbyist of the day. If you asked the average person on the street in West Duluth a hundred years ago who was the King of the Roadbuilders, the likely answer would have been Joseph Becks. Joseph Becks was born in 1865 in Finland and immigrated to the United States alone at the age of sixteen. Walter Van Brunt poetically refers to him as a “friendless lad, [who] endured many of the trials and vicissitudes of those who had to depend upon their toil for support.” However, as a Swedish-speaking Finn (commonly called a “Swede-Finn”), he was the product of a politically and socially privileged ethnic minority in Finland. His first year in the U.S. was spent in Marquette, Michigan, working on a railroad. In 1882, he found his way to Duluth, following the railroad-building work as it moved west. Here he experienced the slumps in employment that followed Duluth’s premature boom-times. He worked as a laborer with various railroads, mining and lumber companies, eventually working his way up to carpenter on Duluth’s ore docks. In 1909, Becks entered public service and became the street commissioner of Duluth, and then inspector for the water and light department. 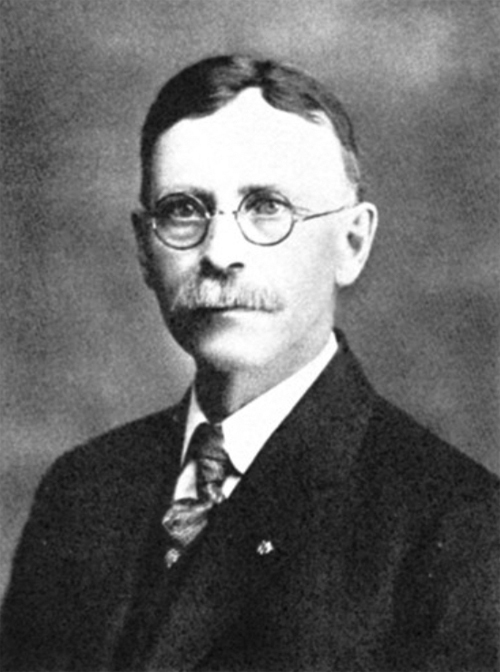 He took a four-year interim from public service to work as a foreman for the Minnesota Steel Company beginning in 1912, but in 1916 left the steel plant after he defeated Charles Kauppi in a very narrowly contested election to become the Fifth District County Commissioner. From that time forth, Beck’s identity was firmly rooted in the construction and maintenance of Duluth’s streets and rural roads. As an immigrant Scandinavian, Becks was most definitely not part of Duluth’s elite movers and shakers, but as a West Duluth politician he wielded his power as a “workingman’s candidate,” advocating frugality in spending and local hiring. He was a Republican, but contrary to the tax allergy exhibited by that party today, his motto appeared to be more along the lines of, “If you want it, you have to pay for it.” And what people wanted most of all, from the lowliest worker of the land to the richest of automobile enthusiasts, was roads—roads that were smooth, and roads that were fast—and at that time, fast meant anything above 20 miles per hour. This massive road resurfacing and building project required tax levies, and just as today, tax levies became highly disputed issues. Rural Duluth farmers desired a quick and easy road to town to dispense with their products, but raising taxes for that precise purpose was anathema to the farmers’ idea of American Independence. Becks fought hard against the establishment for funds toward these ends. In 1920, he charged that the county board was “discriminating against him” in the distribution of funds for road work, and that, out of $1.6 million, he was granted only $100,000. The Fifth District alone had 606 miles of road, and part of that was the pressing issue of resurfacing and grading of the Miller Trunk Highway. In his rounds to all Duluth’s civic clubs, he accused the other commissioners of having a “private jubilee” at a Duluth hotel without him, where they decided to distribute the money to the other districts. This dust-up riled up the residents of his district and resulted in a more than doubling of the Fifth District’s allocated funds, along with his re-election that November. In 1921, Becks was granted the use of a county-owned car. When other commissioners were accused of “joyriding” at the peoples’ expense, he was the first to paint its designation on the door: “St. Louis County, Fifth Commissioner’s District.” As a result, it became a common event for him to be flagged down by tourists seeking information, and newspapers noted that he became a “traveling information bureau” for Duluth’s attractions in the new age of automobile tourism. Becks’ pet project was the then-contentious issue of Thompson Hill. Farmers and teamsters had long complained about the dangerous curves and steepness of this primary thoroughfare into Duluth. He allied himself with them and against the more wealthy automobile hobbyists and traditionalists who preferred the more dramatic entrance of the hill and its direct entrance to Duluth’s downtown. He advocated for an alternate route that veered from what is now Old Highway 61 and I-35 into Gary-New Duluth, which would bring traffic and business through the western reaches of Duluth and thence into downtown. While his road was built, and eventually bore his name, the main point of his effort did fail, and those who enter Duluth from the south endure—and enjoy—the crest of Thompson Hill and its view of Lake Superior to this day. When Joseph Becks died at the age of 72, he was still on the job improving Duluth’s streets as street commissioner, having long since spent eight years as a county commissioner. On the day of his death, he had made an emergency inspection of a street washout on Redruth Street, and had returned to the office to make a report, where a co-worker found him, deceased.